The Grand Rapids Symphony Chorus made its Carnegie Hall debut last week with the Grand Rapids Symphony in New York City. Member of the chorus also made their debut on NBC-TV’s Today Show. Hours before appearing in the venerable auditorium with Music Director Marcelo Lehninger and the orchestra, members of the all-volunteer chorus rose early and trudged to NBC Studios where the show is broadcast, arriving at 6:30 in the morning on an unseasonably chilly morning. After standing outdoors in unseasonably chilly weather, Grand Rapids Symphony Chorus members, waving signs reading “Wake Up and Hear the Beethoven!” and “Hoda! Let us Bring You Joy!” caught the eyes of producers who work the crowd outside. Co-host and meteorologist Al Roker soon followed. “That was when it felt real, and singing right to her and the camera was really fun,” said Krueger, a parish assistant at Messiah Lutheran Church in Grand Rapids. “Ages 20 to 80, it’s a diverse, beautiful, group of people, and they have a special thing that they’re going to perform for us,” Kotb told viewers at home. “That was when it felt real, and singing right to her and the camera was really fun,” Krueger said afterward. Singers launched into an unaccompanied snippet from Beethoven’s “Choral” Symphony No. 9, which the Grand Rapids Symphony Chorus will perform at the Grand Rapids Symphony’s “Beethoven’s Ninth,” the final concert of the 2017-18 season on May 18-19 in DeVos Performance Hall. More than 2,000 people were in the audience on Friday in Carnegie Hall for the Grand Rapids Symphony’s performance of music by Heitor Villa-Lobos, Manuel de Falla and Maurice Ravel. But many more heard members of the Grand Rapids Symphony Chorus sing briefly on national TV. “It’s astonishing that 4 million-plus people may have heard us sing,” Krueger said. Chorus members including tenor Scott Parmenter, associate pastor at First Baptist Church in Allegan, said they soon heard from family and friends who saw them on national TV. “A 2-year-old girl from my church saw me and kept saying to the TV set, ‘Hi Pastor Scott,’”’ Parmenter later learned. 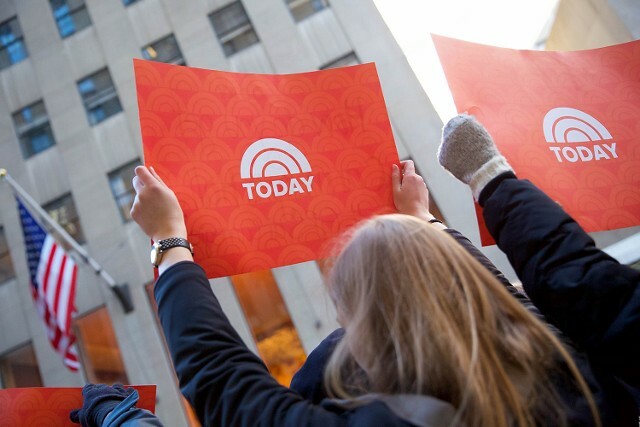 Chorus members credited Today Show’s producers with keeping them informed on the show’s progress, which made the two-hour wait bearable in temperatures that started in the high 30s and only rose into the low 40s.